In New Jersey's early history, any person who owned land free from debts, mortgages, other legal claims or liens was a "freeholder." Those who were elected to serve were the "Chosen Freeholders." At first, legislative functions were performed by the Courts, later by a Board of Chosen Freeholders and Justices. Gradually, the judges became increasingly involved with judicial concerns and in 1798 the State Legislature established the Board of Chosen Freeholders as the legislative and administrative head of county government in New Jersey. As a result, the 21 counties of New Jersey serve as a middle level of government between the state and federal governments and the municipalities. The counties deal with regional problems such as solid waste disposal and water supply, as well as the historic responsibility with the courts, roads, general government, and the conduct of elections. For the first half of the nineteenth century, the system of apportioning Freeholders remained absolutely rigid; two Freeholders for each township, town or city. But when the number of townships in the county began to grow at an appreciable rate, the board membership became unwieldy. For example, if that rule were in effect today, Monmouth County would have 106 persons sitting on the Board of Chosen Freeholders, as there are 53 municipalities in the county. Monmouth County is governed by five Freeholders elected at-large for three year terms. Each January, the Freeholders select one of their members to serve as the director of the board for the year to preside over the meetings and activities of the board. Ordinarily, on the second and fourth Thursdays of each month, the Board meets for an afternoon workshop session in the Hall of Records and again in the evening with a formal Regular Meeting. On the fourth Thursday of each month, from March through September the Regular Meeting is held in one of the 53 towns in Monmouth County. The meeting schedule may also be adjusted for holidays and special events. 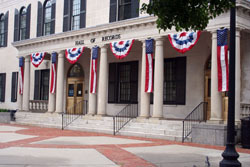 Regular Meetings are those in which the Freeholders take formal action. Workshop meetings are informal discussions of items to be considered at the next Regular Meeting and other important matters. Both Regular and Workshop meetings are open to the public.